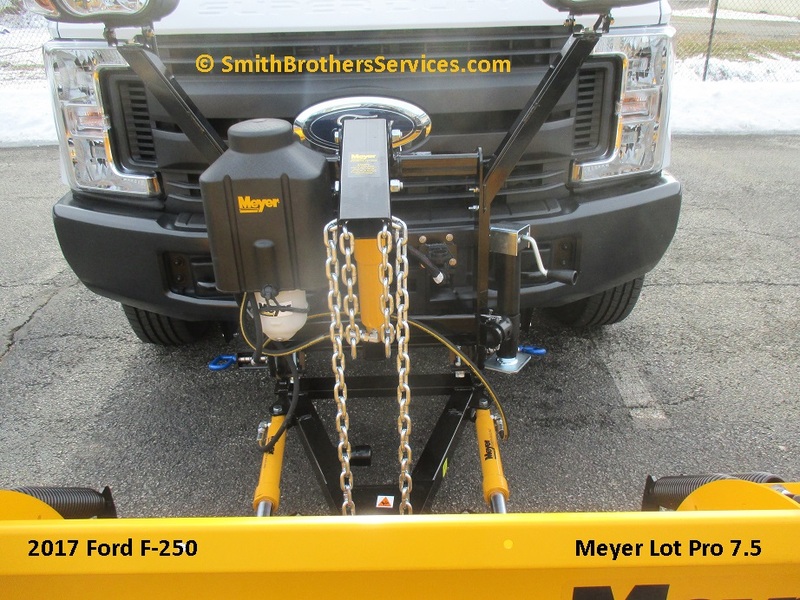 This is an install we did for Meyer Products directly, for one of their national fleet customers. 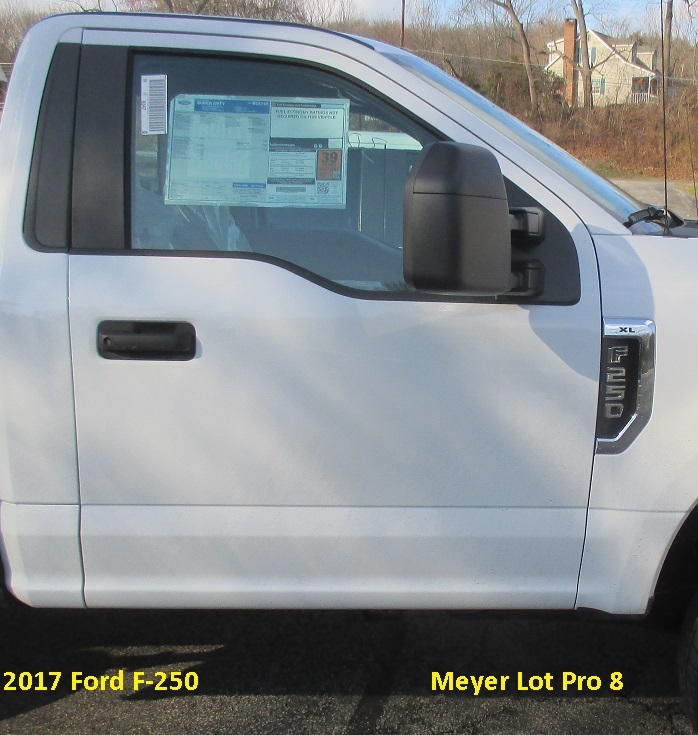 Ford corporate shipped this 2017 F-250 to the local Ford dealer. 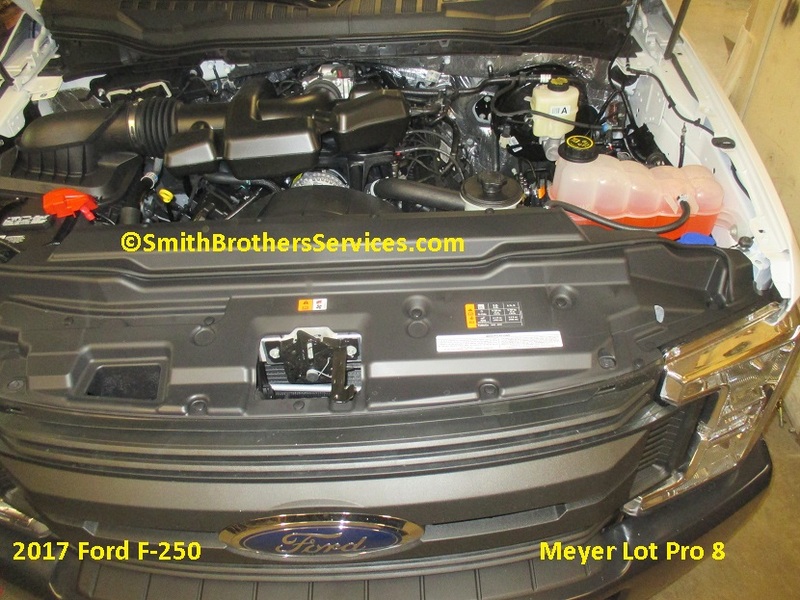 The local Ford dealer delivered the vehicle to us for the install. Meyer shipped us the Lot Pro 7.5 to install on it. We would have gone with an 8' blade, but we were just the installer, and had no say in the matter. ▬Front spring / GAWR upgrade (refer to the Weight Ratings charts for specific spring / GAWR selection for each model). ▬ 6.2L Gasoline: Extra HD 200 amp alternator. 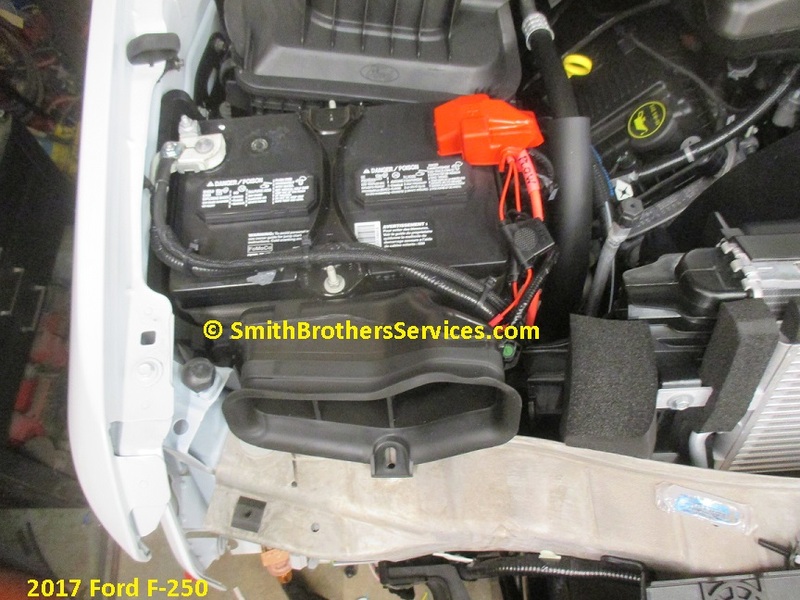 Optional 240 amp Extra Extra HD alternator. ▬ 6.7L Diesel Pickup: Extra HD 220 amp alternator. 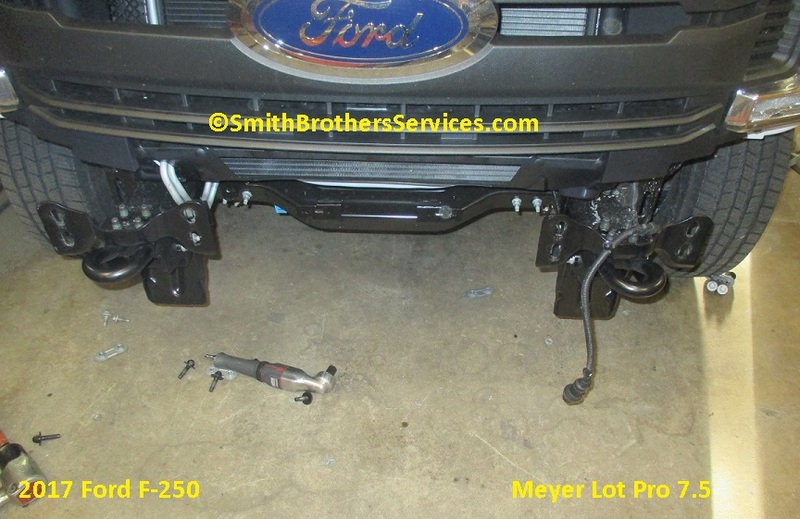 Optional 332 amp dual alternators. ▬ 6.7L Diesel Chassis Cab: 332 amp dual HD alternators. Optional 377 amp dual Extra HD alternators. 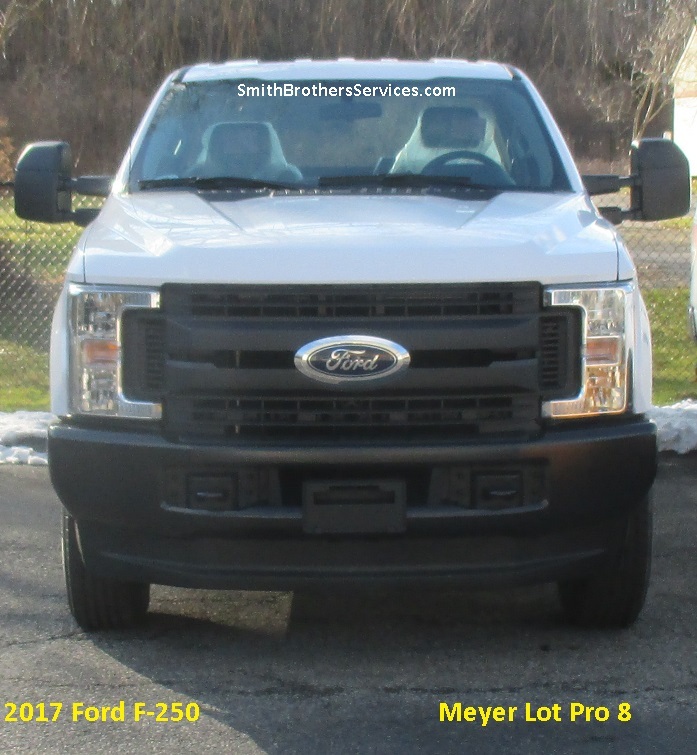 Ready to start, this truck is brand new, delivered with dealer plates for the install. Window sticker still on it. SO MUCH has changed from 2016 under the hood. Look at the giant cover over the radiator support. The air box is now on the passenger side, and the coolant jug is where the air box used to be. There is actually an intake duct that goes under the battery tray, I assume to help cool the battery. A closer look at the intake (plastic cover removed from radiator support) you can also see the radiator support is no longer painted. 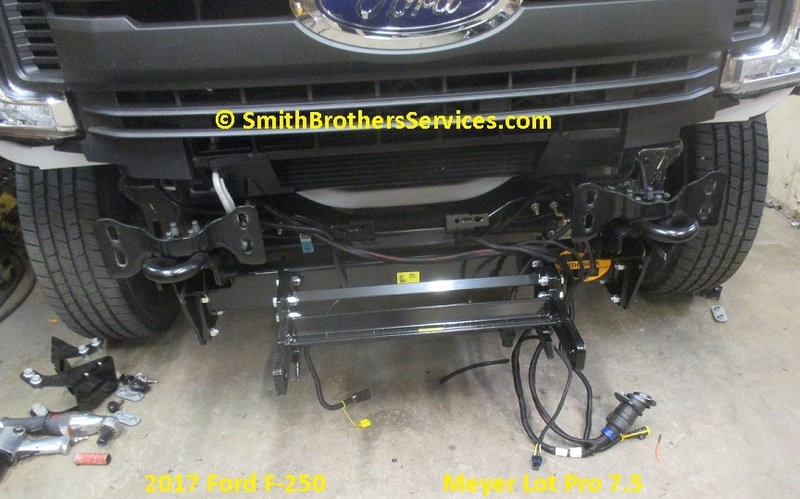 Front bumper removed to install plow mount. 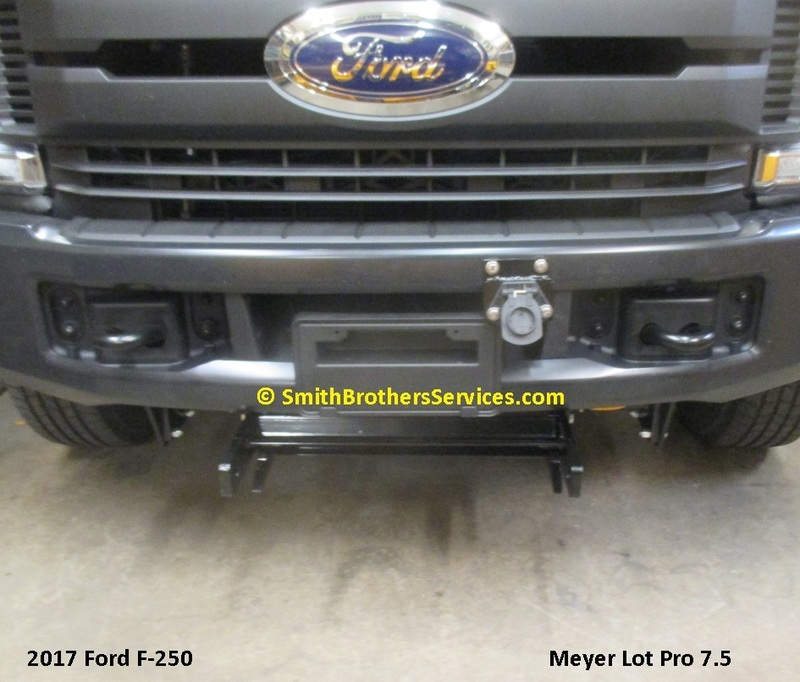 Note that the bumper is now held on by 4 bolts on each side instead of 2 like in previous years. 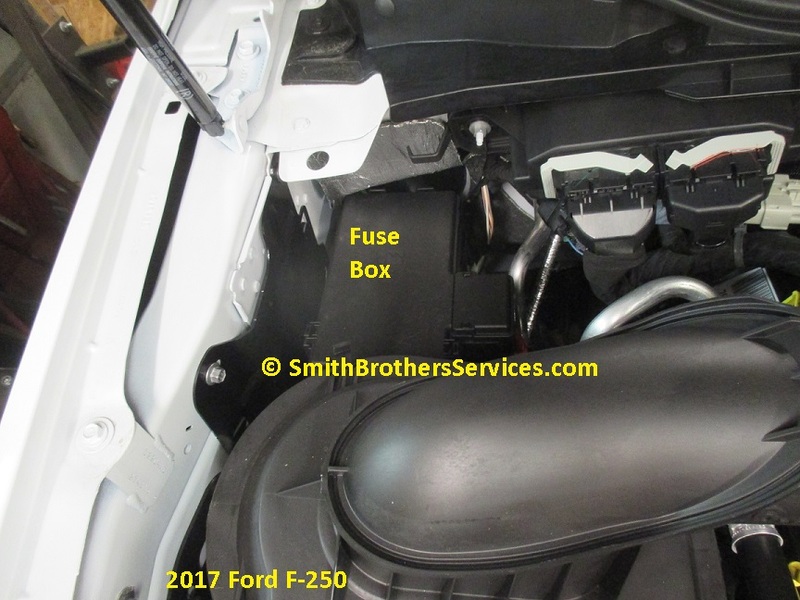 The fuse box under the hood is now at the firewall on the passenger side (used to be on the driver's side). Plow wiring installed, connections made at battery. Removed the ground terminal, and drilled a hole in it for the plow ground. This is because the nut you see it the one that tightens the battery clamp. There is no spare stud. 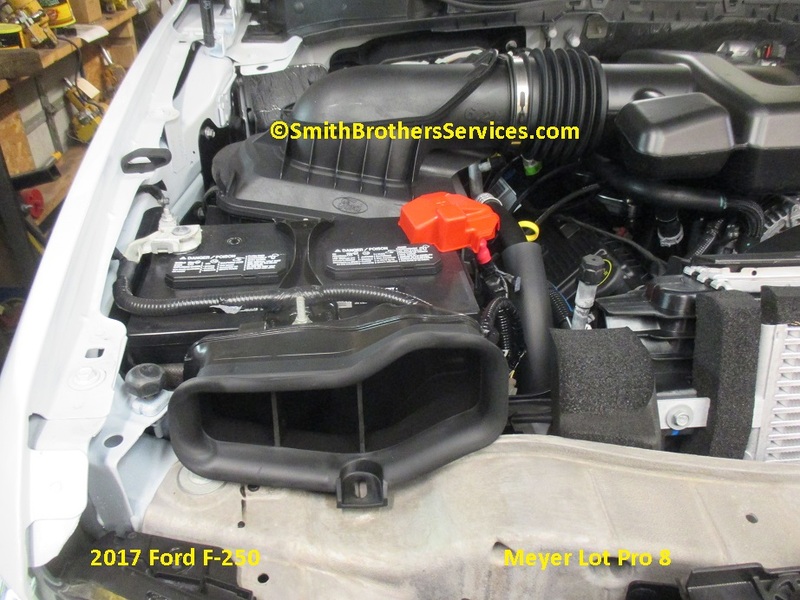 I guess Ford does not expect any accessories to be grounded to the battery? Plow wiring installed, connections made at battery. Mount install complete. Reinstalled the headlights and grille which were removed for the install as well. Front bumper reinstalled. We removed the lip (air dam) instead of cuting it. 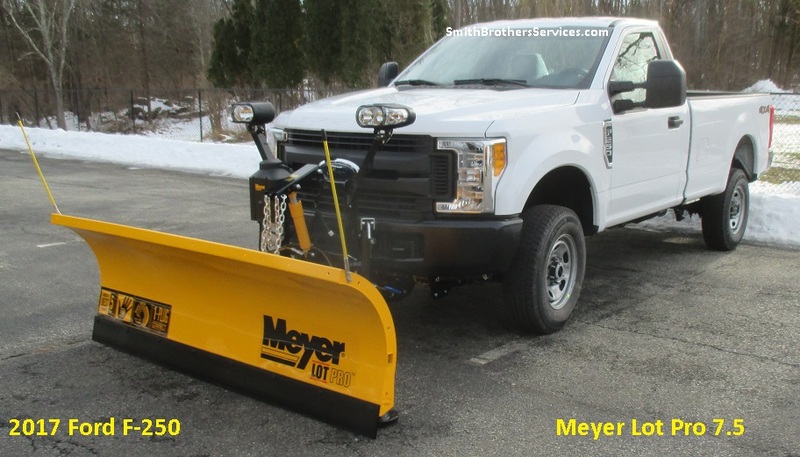 This is because there is about 1/4" between the bottom edge of the bumper and the plow mount. The center would have to be completely cut out, as opposed to just trimming it to fit around the mount. 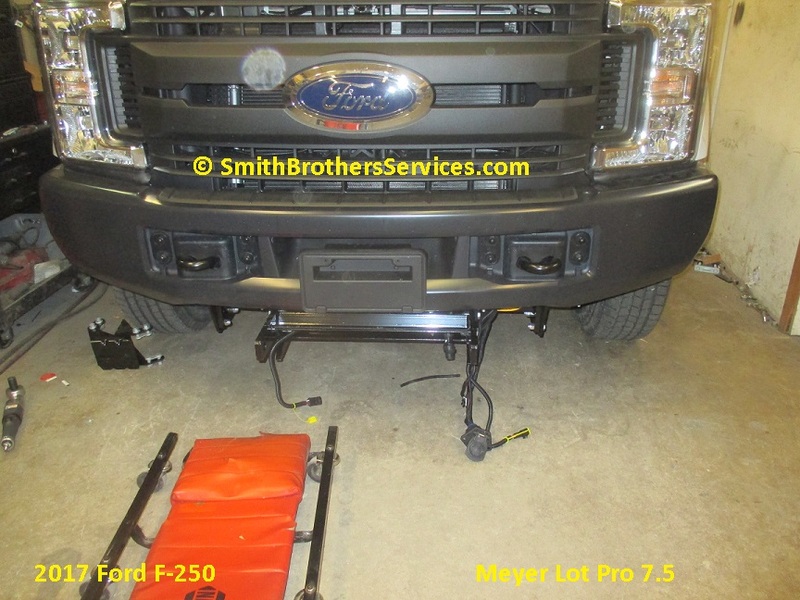 IF you have seen any of our Superduty install pics from 2008 - 2016, you know we mount the 1 piece plug on a custom bracket next to the license plate. Well, Ford added A LOT of plastic behind the license plate that was never there on previous years. There was quite a bit of trimming to run the harness out behind the bumper. 1 piece plug mounted on custom bracket with stainless hardware. All set, ready for pickup. 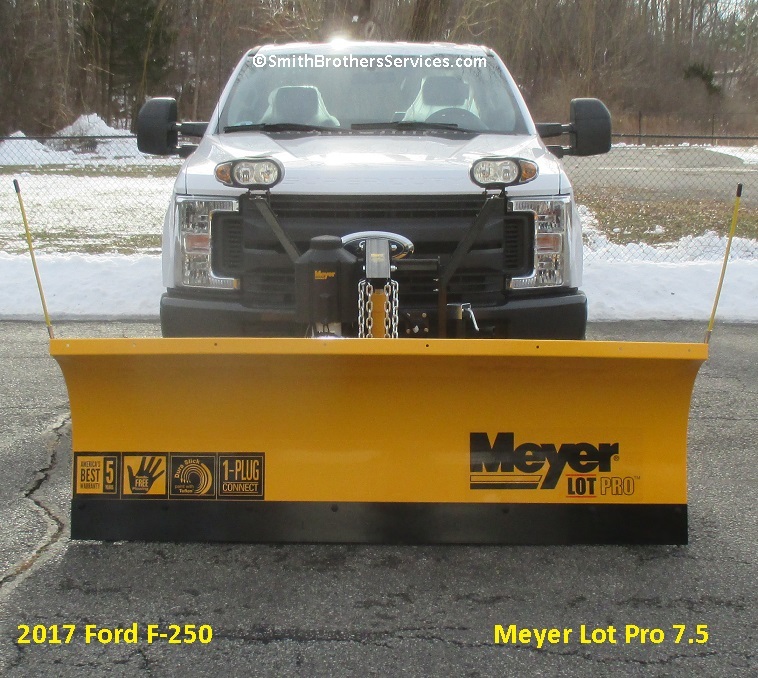 3/4 view of the 2017 Ford F-250 with Meyer Lot Pro 7.5 installed. 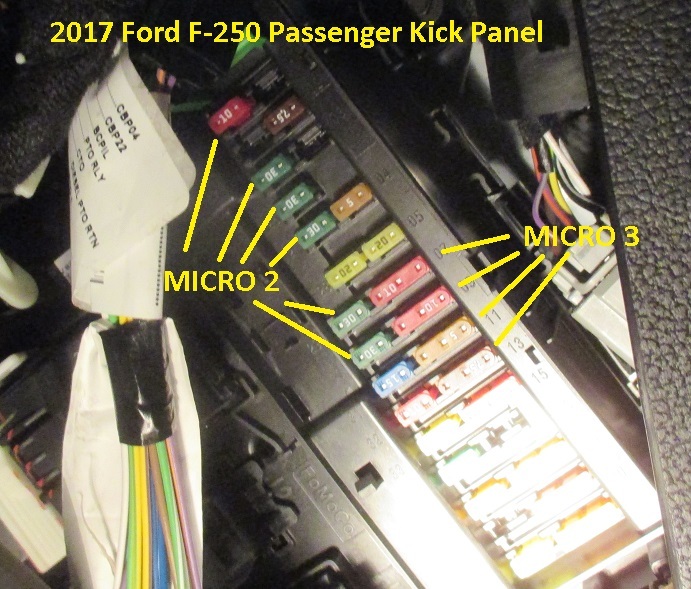 Well Ford is now using the Micro2 and even Micro3 fuses on the 2017 F-250. GM started using them in 2015, and Dodge did too. 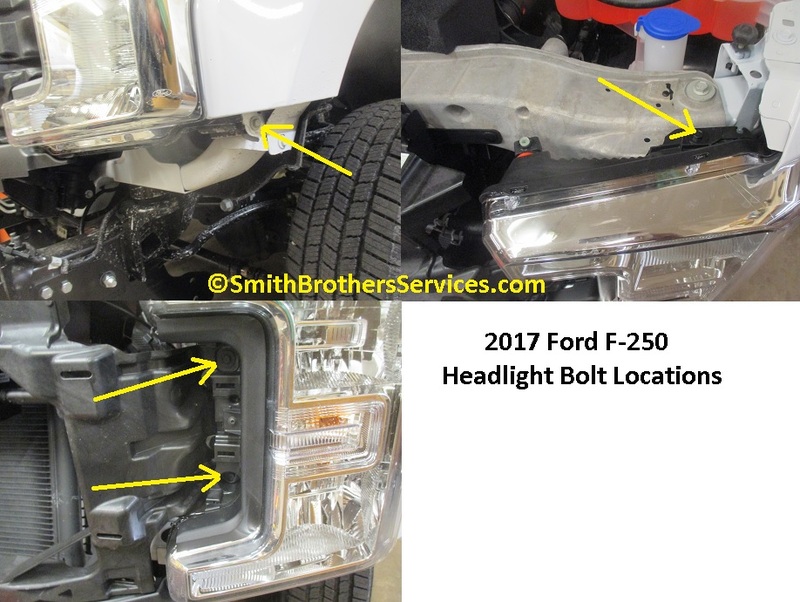 A look at where the headlight bolts are located on the 2017 Ford F-250.